A TALE OF FAMILY, FUN, AND FROGGY ADVENTURES! 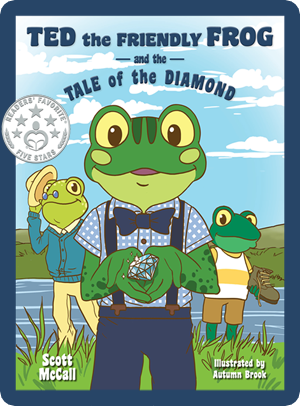 Ted the Friendly Frog and the Tale of the Diamond captures the journey of a brave, adventurous frog as he encounters meaningful challenges and teachable moments. With a significant purpose behind his story, author Scott McCall shares lessons for young readers through the first release in his Ted the Friendly Frog book series. McCall’s adorable character, Ted, lives by a pond and spends his froggy days playing with his friends, hopping in the grass, and swimming very fast. One day, Ted's grandfather tells Ted something important - he's going away for a few days, and could Ted look after his special diamond? Ted must not play with the diamond with his friends or even show anyone, for it is an old tradition to pass the diamond down to the next frog in the family, and it's a very valuable stone. In a bouncing and rhyming tale, Ted learns the important lesson of listening to his family, even if it is more fun to play, and discovers it is never too late to learn from a mistake. Ted has a big race coming up—the race at Golden Lake! Last year, he only placed seventh, but this year he’s hoping to win the whole thing. When Ted gets a little lost in the woods on the way to the race, he meets all sorts of new friends as they work together to help find his way back. Once the race begins, Ted finds himself in a tough spot, and he must decide between going for gold or learning from the lesson his new friends have taught him and helping someone in need. 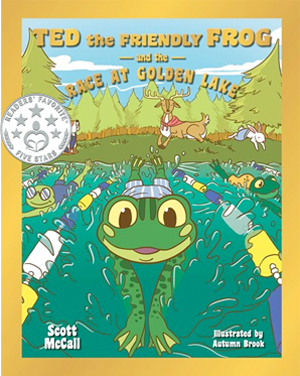 Join Ted in the second book of Scott McCall’s fun froggy series, Ted the Friendly Frog and the Race at Golden Lake, and learn how helping a friend can make you feel more like a winner than any trophy! LOOK WHO’S TALKING ABOUT TED! "A delightful story that captures our imagination and reminds us of the value of loving and trusted relationships." "A charming and engaging story, full of rhymes for early childhood readers." "The moral of the story is that we should always follow instructions from either our parents or grandfathers when we are young, and when we become adults, we have to be held accountable for our actions. I would enjoy reading more about Ted the frog and his adventures." "Ted is quite a character, even for a frog. His adventure seems to turn out well because he does the right thing, if not initially, eventually." "Having played sports most of my life, I can relate to what Ted experiences in this book. Ted is a great character for readers to follow along with and learn important lessons they can use every day." "What a fun book! Ted learns that within us, we have hidden strengths that are just as valuable as being first in the race. With rhyming and adorable characters, Ted the Friendly Frog and the Race at Golden Lake are winners!" "Redefining the true meaning of a ‘winner’, this story teaches values such as teamwork, sacrifice, sportsmanship and helping others - values that can be overlooked in today’s competitive world."